Following oil recently has been a lot like riding a roller coaster. It all started with a drastic fall and now we’re in the ups and downs. Recently, oil rallied and several experts were happy to see it, weighing in with their bullish opinions for the future. Of course, there were other experts with bearish opinions on the commodity, including myself. I have to admit that reading the bullish posts around the web was interesting and I thought about changing my stance a couple of times. However, there was just too much negative data out there to switch to a bullish opinion. Today, more data became available, proving that the bearish opinion is likely the one to win the race… at least for the time being. Today, we’ll talk about why the oil market has fallen so dramatically over the past year, what data became available today and what we can expect to see moving forward. As with any other commodity, the value of oil is generally at the mercy of the law of supply and demand. This law tells us that when the supply of a commodity is high and the demand for the commodity is low, we generally see the value of the commodity decline. Adversely, the value of a commodity tends to climb under conditions in which the commodity is in high demand and the supply of the commodity is low. 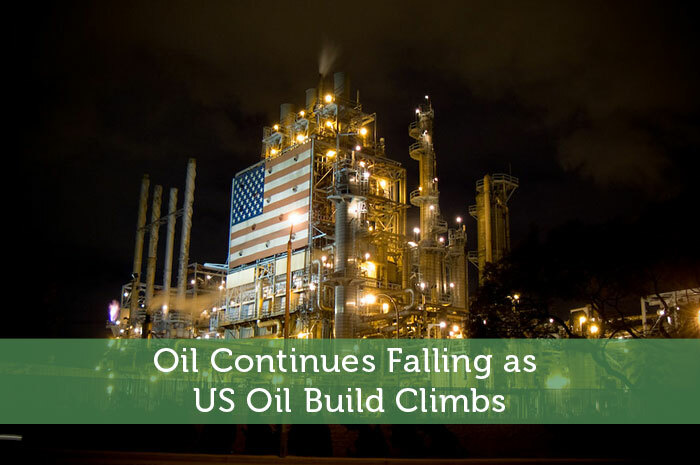 As mentioned above, the value of oil fell dramatically as the result of a supply glut, and data out of the United States shows that the supply glut may be getting even worse. The Energy Information Administration, also known as EIA, announced today that US crude oil inventories rose by 8 million barrels last week! That is a massive number and far higher than anyone expected. Depending on the poll you look at experts expected to see a rise of between 3.9 million barrels and 7.1 billion barrels. Either way, the 8 million barrel total that came in was a major hit to the price of the commodity. Today alone, Oil fell by more than 2%; clocking in the third consecutive day of declines in the value of the commodity. Moving forward, I’m not expecting to see much positive news out of oil. The reality is that the supply glut issue took years to get to this point and it doesn’t seem as though there’s going to be a solution any time soon. In fact, back when the declines started, I predicted that we would see low prices in oil for a minimum of 2 years. Now, here we are about a year later and I don’t see things getting any better. In fact, I’ve revised my prediction with regard to when oil will get back to $80 per barrel or more. Based on what I’ve seen over the past year as well as what we’re seeing in the market, I’m not expecting oil to reach the $80 mark until the year 2018 at best. However, it’s important to remember that I don’t have a crystal ball and I can’t see into the future. Really, anything could happen, but with the data that I’ve seen I’d be surprised if oil surpassed $80 per barrel before 2018. Where do you think oil is headed and why? Let us know in the comments below!